Unstable nanoparticles can have important consequences on the larger environment, according to Dr. Alexandra Navrotsky, director of nanomaterials research at the University of California, Davis. An energetic scientist and an engaging speaker, Navrotsky leads research into the relative stabilities of common geological materials as a function of particle size, all the way down to nanometer scales. She shared her team's recent results at the Frontiers in Biogeochemistry Seminar Series at Pacific Northwest National Laboratory. The series features academic, government, and industrial leaders who discuss novel ideas and research advances. In this seminar, the University of California professor discussed nanoparticles and their influences. Specifically, she discussed examples of her recent work in the relative energetics of nanophases and how at small scales, phases that are normally less stable can become dominant. She uses a technique called drop solution calorimetry to measure tiny amounts of heat released when materials are dissolved. The amount of heat is related in part to the atomic structure of the material. "Energetics whisper secrets of the strength of chemical bonds," said Navrotsky. Water matters. Nanoparticles generally come wrapped in layers of water. The effect of that water must be considered when studying the relative energetics of nanoparticles. If water is ignored, "urban myths" ensue, as was the case with early work on titanium dioxide, which suggested that the atoms in the nanoparticle vibrate more easily than those in more massive material. Navrotsky and her team have disproved this myth, showing that this apparent effect was the result of the large impact of water on the heat capacity, rather than of changes in the lattice vibrations. Shape matters. Nanoparticles are rarely perfect spheres. They come in configurations ranging from tiny, lumpy snowballs to large, spikey thorns to long rods or wires. The shapes and the water they effect influences how much energy is available inside the particles. By controlling the shape, scientists can create particles with different surface energies, capable of different reactivity and function. These are just a few examples from the seminar, which attracted an audience of scientists from across Pacific Northwest National Laboratory. Dr. Alexandra Navrotsky: A noted scientist and professor, Dr. Navrotsky is the director of the Nanomaterials in the Environment, Agriculture and Technology Organized Research Unit and the Peter A. Rock Thermochemistry Laboratory at the University of California, Davis. Her research interests have centered on relating the features of nanomaterials to the behavior of larger materials. 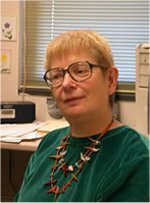 Her extensive honors include National Academy of Sciences member, the Roebling Medal of the Mineralogical Society of America, American Geophysical Union Fellow, Geochemical Society Fellow, and the Benjamin Franklin Medal in Earth Science.